exactly what your diet is most likely missing. whole grasses, apple fiber or pectin, rice bran, or flax. potency and are a likely source of genetically modified food. mental clarity and overall well-being. 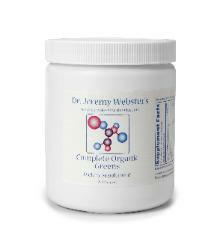 Complete Organic Greens Powder from damaging light, oxygen and moisture once the product is bottled. Why is Complete Organic Greens Powder unique and superior to other greens products? Chlorella in Complete Organic Greens is a specially cultivated, easy to digest strain with a soft cell wall. Hard cell strains require nutrient depleting “cracking” methods. do have vegetables, french fries are the most common selection! grains and potatoes, and meats from corn-fed animals and their dairy products. osteoporosis, immune disorders, and various degenerative diseases of the bones, joints and spine. nutrients in their body fat and milk. calcium and magnesium and/or you should reduce your consumption of grains and carbonated beverages. detrimental effects of grains' allergenic components on the immune system. products such as Grass-Fed Whey Protein.